When wandering around the city last night we could see a tower taller than all others in the city, covered with hundreds of white lights. You can just see it in the background rising above the other buildings. Today we were walking by the river and saw it from another angle. It had a platform sticking out of it near the top. At first I thought this might be some kind of observation deck, but as we kept looking neither of us saw any movement up there. It then became obvious that it was a helipad and not an observation deck, but I had seen the building listed on Trip Advisor so I was pretty sure we could get in and take a look. 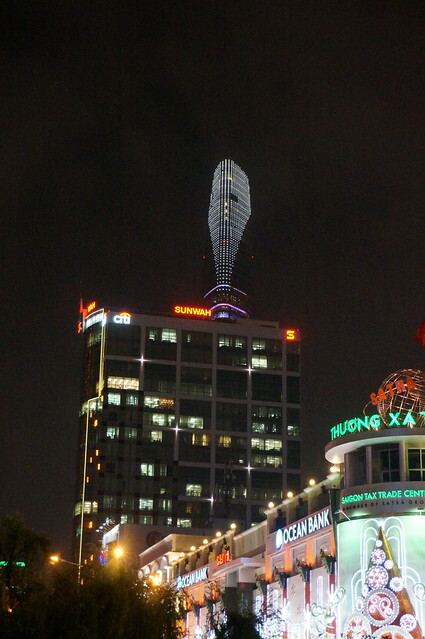 The tower is the Bitexco Financial Tower and it is the second highest building in Vietnam (it was the highest until 2011). We walked into the lobby and saw some guys asking about getting up to the bar. Their clothes wouldn’t be out of place on a beach but were totally out of place in that building, so we tagged along. 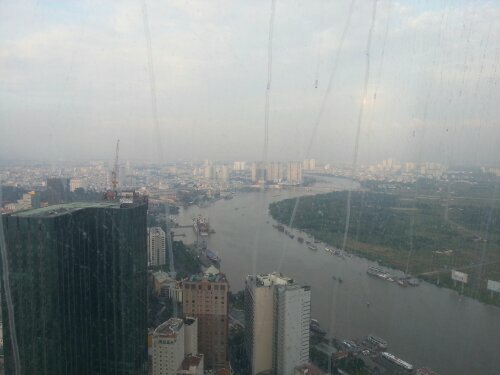 We were shown into the lift which would take us to the 50th floor, in about 20-30 seconds. It must have been shifting at a huge rate but it was so smooth, we couldn’t detect any movement and if it wasn’t for our ears popping every few seconds we’d have been none the wiser. Once on the 50th floor we were escorted to another lift to whisk us up the final few floors to the 52nd. We were looking around in amazement, after all this was the highest building we’d ever been in, when a waitress came over and told us we had to order a drink to be allowed to stay. That sounded fine so we accepted the menu. The drinks were between 250,000 and 350,000 Dong per glass, that’s about £8-£10 for a beer or vodka or whiskey. Whoa – we spent a minute or so agonising over whether to pay that much for a drink. We decided we wouldn’t do it again so why not? The good news is the drinks weren’t to UK measures; you could really taste the alcohol in the drink. As it turns out it’s not a bad price. 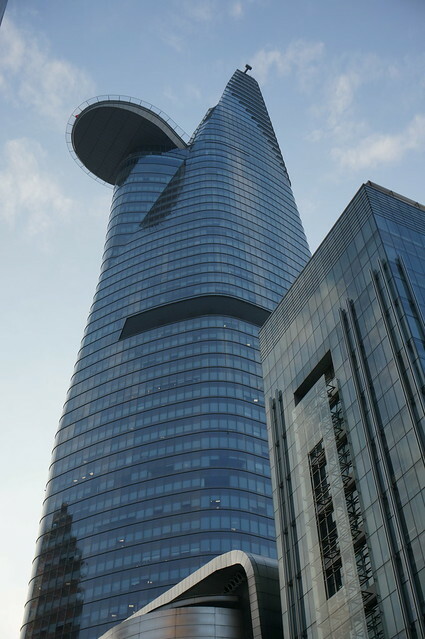 To go to the 49th floor there is 200,000 Dong fee (per person). So the drinks are normal price with the 200,000 added to them. 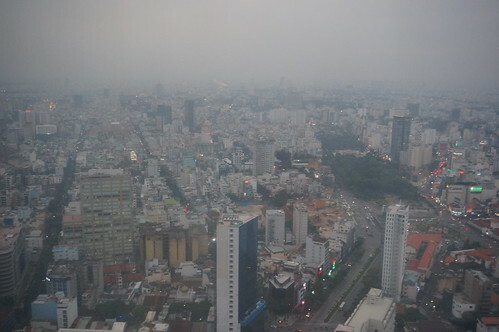 We got to watch the sunset from the 52nd floor looking over Saigon. 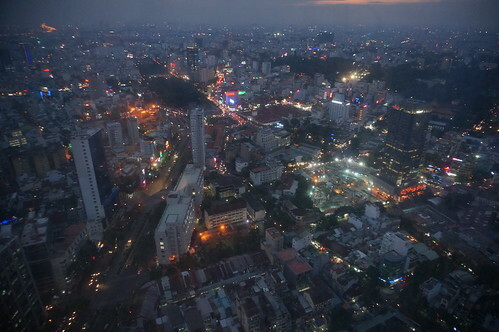 The windows were very dirty, so very few photos came out OK, but to sit and watch the city light up was memorable and worthwhile experience. 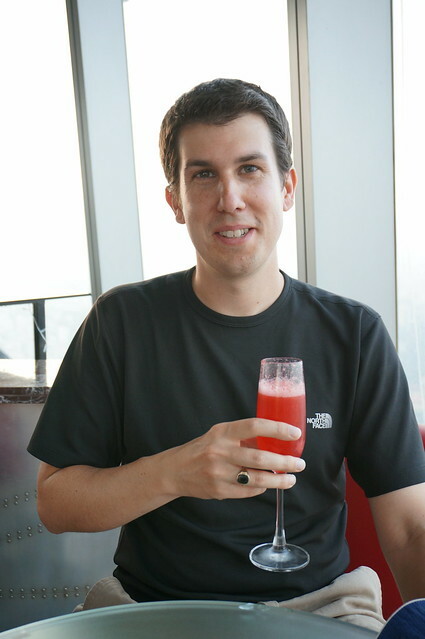 Me, with my usual pink drink. A champagne cocktail. 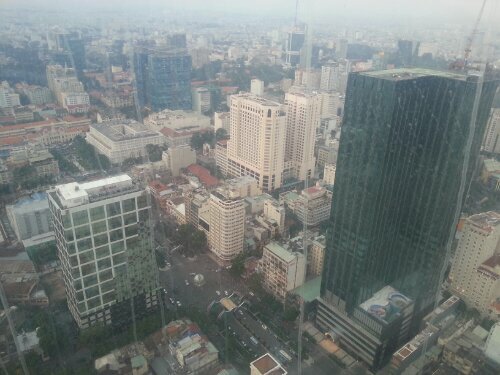 The 52nd floor is also where the helipad is located. Straight out of the chopper and into the bar. Well thought out. Sounds a bit like the CN Tower, except you can feel the elevators moving there.